Background: The purpose of this study was to use the National Cancer Institutes' Surveillance, Epidemiology, and End Results (SEER) database to perform a large-scale analysis of brainstem anaplastic astrocytoma (AA) and glioblastoma multiforme (GBM). Use of the SEER database gave us a larger sample size of this rare tumor type, allowing for the analysis of the relationship between prognostic factors and survival. Materials and Methods: We selected pediatric patients (<18 years old) from the SEER database with histologically confirmed diagnoses of primary high-grade gliomas (World Health Organization Grade III/IV) of the brainstem. In univariate and multivariate analysis, we analyzed the relationship between demographic (age, gender, race, diagnosis date), histologic (AA, GBM), and treatment (surgery, radiation) factors on survival. Results: In our cohort of 124 patients, those with AA had a median survival of 13 months and those with GBM 9 months. Higher-grade tumors were associated with statistically significantly increased mortality (hazard ratio [HR]: 1.74, confidence intervals [CIs]: 1.17-2.60). Surgical intervention was associated with a significantly lower mortality, either alone (HR: 0.14, CI: 0.04-0.5) or in combination with radiation (HR: 0.35, CI: 0.15-0.82). Radiation therapy alone was significantly associated with decreased mortality within the first 9 months after diagnosis but not with overall mortality. No demographic characteristics were significantly associated with mortality. Conclusions: Outcome remains poor in the pediatric high-grade brainstem glioma population. 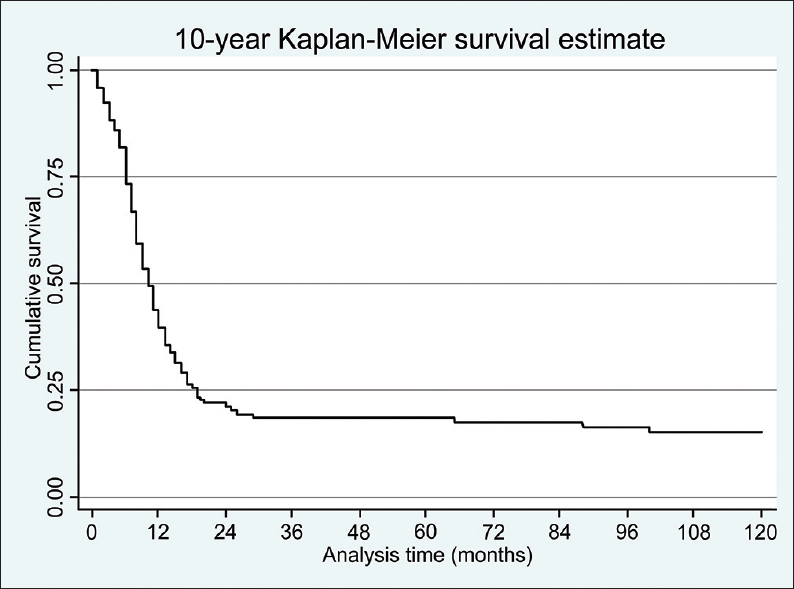 Survival is correlated with lower-grade tumor histology, radiation therapy only in the first 9 months after diagnosis, and surgical resection. Background: Craniosynostosis (CS) syndrome is an autosomal dominant condition classically combining craniosynostosis and non-syndromic craniosynostosis with digital anomalies of the hands and feet. The majority of cases are caused by heterozygous mutations in the third immunoglobulin-like domain (IgIII) of FGFR2, whilst a larger number of cases can be attributed to mutations outside this region of the protein. Aims: To find out the FGFR1, FGFR2, FGFR3 and FGFR4 gene in craniosynostosis syndrome. Settings and Design: A hospital based prospective study. 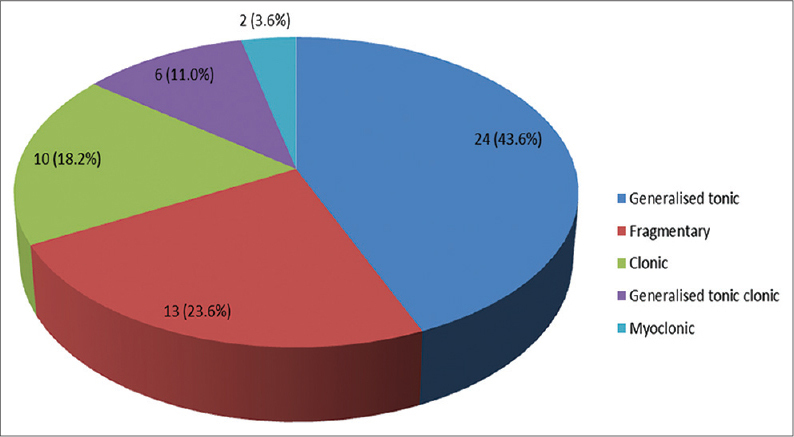 Materials and Methods: Prospective analysis of clinical records of patients registered in CS clinic from December 2007 to January 2015 was done in patients between 4 months to 13 years of age. 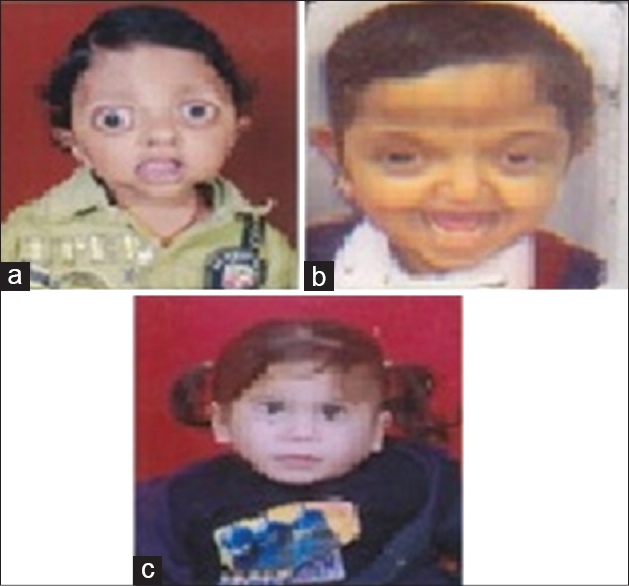 We have performed genetic findings in a three generation Indian family with Craniosynostosis syndrome. 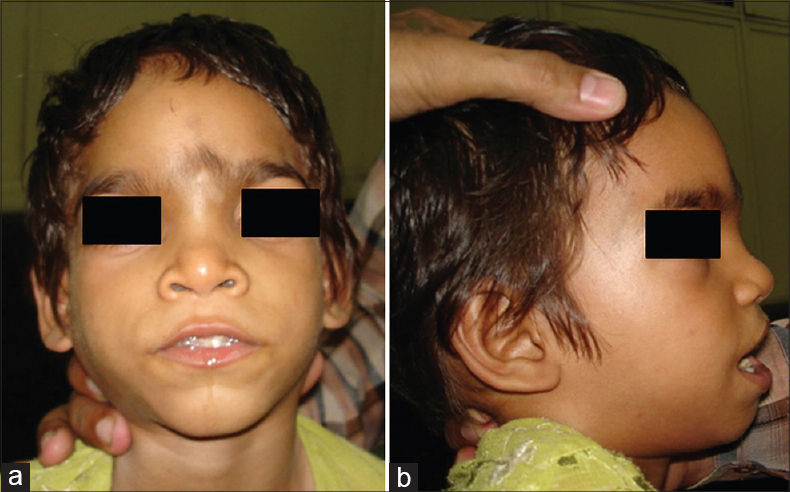 Results: We report for the first time the clinical and genetic findings in a three generation Indian family with Craniosynostosis syndrome caused by a heterozygous missense mutation, Thr 392 Thr and ser 311 try, located in the IgII domain of FGFR2. FGFR 3 and 4 gene basis syndrome was eponymously named. Genetic analysis demonstrated that 51/56 families to be unrelated. In FGFR3 gene 10/TM location of 1172 the nucleotide changes C>A, Ala 391 Glu 19/56 and Exon-19, 5q35.2 at conserved linker region the changes occurred pro 246 Arg in 25/56 families. Conclusions: Independent genetic origins, but phenotypic similarities in the 51 families add to the evidence supporting the theory of selfish spermatogonial selective advantage for this rare gain-of-function FGFR2 mutation. Background: Pediatric intramedullary spinal cord lesions are not only rare but also different from adults in a number of aspects. We aimed to study the incidence and the frequencies of various pediatric intramedullary mass lesions, their outcome to treatment and the factors determining their outcome of treatment. Materials and Methods: Thirty-one consecutive children (aged 1-18 years, mean 11.1 years, male: female = 1.8:1) with pathologically proven intramedullary spinal cord lesions treated at our center were studied. Clinico-radiological, histopathological, operative, and outcome data were reviewed retrospectively. The functional status was assessed using the modified McCormick grading system. Results: Gross total tumor excision was performed in 19 patients (61.3%), subtotal in 9 patients (29%), partial excision was performed in 2 (6.5%) patient, and only biopsy was performed in 1 patient (6.5%). There was one peroperative death, 2 patients died at follow-up. Complications included wound related complications (n = 4), transient deterioration in the motor power, and respiratory complication requiring a tracheostomy. Six patients showed recurrence at a mean follow-up of 16.4 months. Developmental tumors, high-grade ependymomas, and incompletely excised grade 2 ependymomas showed a tendency to recur. Conclusions: Children constituted nearly 1/5 th (17.4%) of intramedullary spinal cord tumors. Astrocytomas and ependymomas taken together constituted the most common intramedullary spinal lesions in children; however, developmental tumors predominated in the first decade. Children usually presented in good functional grades preoperatively and maintained good grades after surgery. Functional outcome was dependent on the preoperative neurological status and histopathology of the lesions. Objectives: The prevalence of obesity is rapidly increasing among Indian children, who, in general, are more prone to develop metabolic complications at an early age. Valproate and phenytoin are commonly used antiepileptic drugs in children. This study aimed to assess the parameters of the metabolic syndrome in Indian children with epilepsy on valproate or phenytoin monotherapy. 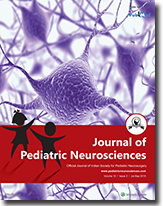 Methods: This cross-sectional study recruited children from the Pediatric Epilepsy Clinic, Department of Pediatrics, Kalawati Saran Children Hospital, New Delhi from March 2012 to September 2012. All consecutive children diagnosed with epilepsy as per International League Against Epilepsy definition aged 3-18 years on valproate or phenytoin monotherapy for at least 6 months were enrolled at a tertiary care children's hospital in Northern India. After clinical and anthropometric evaluation (including body mass index [BMI] and waist circumference), the blood samples were analyzed for fasting serum glucose, total cholesterol, high-density lipoprotein-cholesterol, and serum triglyceride. Results: Children with BMI >95 th centile and waist circumference >90 th centile were not significantly different among children on valproate and phenytoin monotherapy. Children on valproate had significantly higher mean serum triglyceride (96.9 mg/dL vs. 77.6 mg/dL; P < 0.001) and total cholesterol (148.3 mg/dL vs. 132.8 mg/dL; P = 0.002) levels as compared to children on phenytoin monotherapy. Conclusions: The lipid abnormalities may be observed in children on valproate or phenytoin therapy and may warrant periodic screening. Background: Neonatal seizures contribute significantly to newborn morbidity and mortality particularly in developing countries including Nigeria. Unfortunately the countries with high incidence of neonatal seizures often lack the facilities to adequately diagnose, monitor and prognosticate the condition. Objective: We set out to determine the factors at presentation that predict death among babies admitted with clinically identifiable seizures. Methods: We prospectively observed consecutive neonatal admissions over a nine month period at the Wesley Guild Hospital, Ilesa, Nigeria. Babies with seizures were identified based on clinical observation. Perinatal history, examination and laboratory findings were compared between babies with seizures who survived and those that died. Multivariate regression analysis was used to determine the predictors of mortality. Results: Over a nine month study period, a total of 340 babies were recruited out of which 55 (16.7 percent) had clinically identifiable seizures. Fifteen (27.3 percent) of the 55 babies with clinically identifiable seizures died; while 20 (7.0 percent) of the 285 babies without seizures died. Clinically identifiable neonatal seizures contributed to 42.9 percent of the overall mortality in the neonatal unit during the study period. The risk factors for mortality among the babies with seizures were clinical seizures in the first 24 hours of life, birth asphyxia co-existing with hyponatraemia and presence of cerebral oedema (P < 0.05). The independent determinant of mortality among babies with clinical seizures was cerebral oedema (OR = 4.025; 95% CI 1.342-26.956; P = 0.019). Conclusion: We conclude that clinically identifiable neonatal seizures contribute significantly to neonatal mortality and presentation within 24 hours of delivery, birth asphyxia and cerebral oedema increased the risk of death in babies with seizures. Variations in split cord malformation (SCM) have been described earlier. 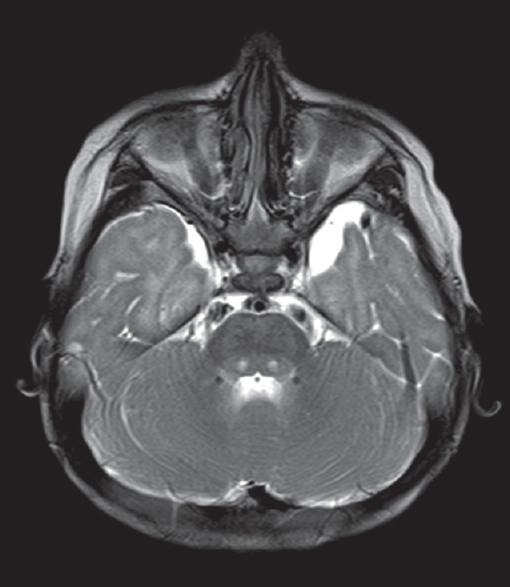 However, a true hemimyelomeningocele (HMM) as only congenital malformation is extremely rare and is reported infrequently in published literature. We are reporting the case of a 3-month-old girl child who presented with a swelling on the lower back since birth. Magnetic resonance imaging revealed a type 1 SCM with right hemicord forming a HMM. Precise diagnosis and thorough anatomical detail of dysraphism is essential for optimal, individualized neurosurgical management. Syringohydromyelia is a frequent finding in cases of tethered cord syndrome. The classical teaching is that the development and progression of a syrinx is a chronic process. We present a case report of an acute onset syringomyelia in an infant, who underwent an excision of a lumbosacral transitional lipoma and detethering of the cord. Immediately after recovery, the infant was found to have flaccid paraplegia. 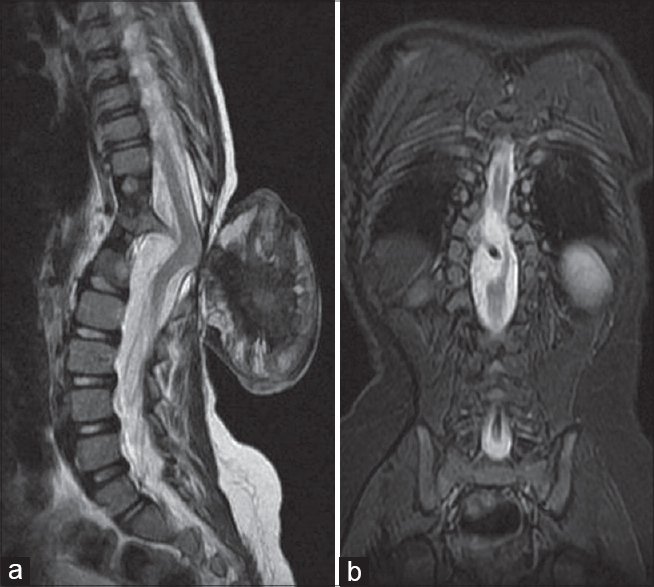 An emergency magnetic resonance imaging revealed a large acute onset syringomyelia for which he underwent an emergency midline myelotomy and release of fluid from the syrinx. Though the eventual recovery was good, this made us re-visit our understanding of the concept of syringohydromyelia. The case details and a plausible hypothesis for the rapid development of the syrinx are presented. Middle interhemispheric variant (MIH) of holoprosencephaly (HPE) or syntelencephaly is a rare variant of HPE characterized by abnormal midline union of the posterior frontal and parietal lobes with variable fusion of thalami. It varies from classic HPE in embryopathogenesis, severity of fusion of brain structures, associated craniofacial anomalies and clinical presentation. 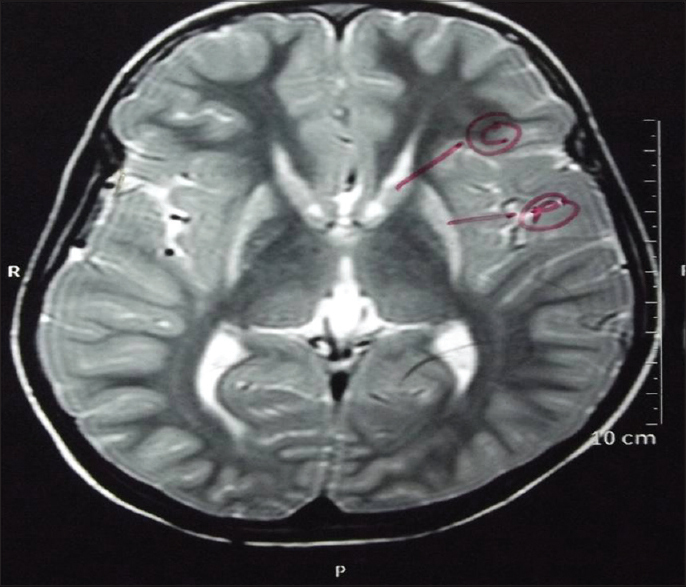 We report a case of MIH in a 5-year-old girl, who presented with severe developmental delay and discuss the features differentiating it from other more common forms of HPE. Anterior fontanelle cysts are rare in occurrence in the area of anterior fontanelle. Most of them are dermoid cysts. Epidermoid cysts are even rarer to be seen. Authors are reporting a rare case of epidermoid cyst located in anterior fontanelle along with two cases of dermoid in this area. Magnetic resonance imaging revealed that a cystic swelling was present in the anterior fontanelle area. Few cases have been reported in the literature. 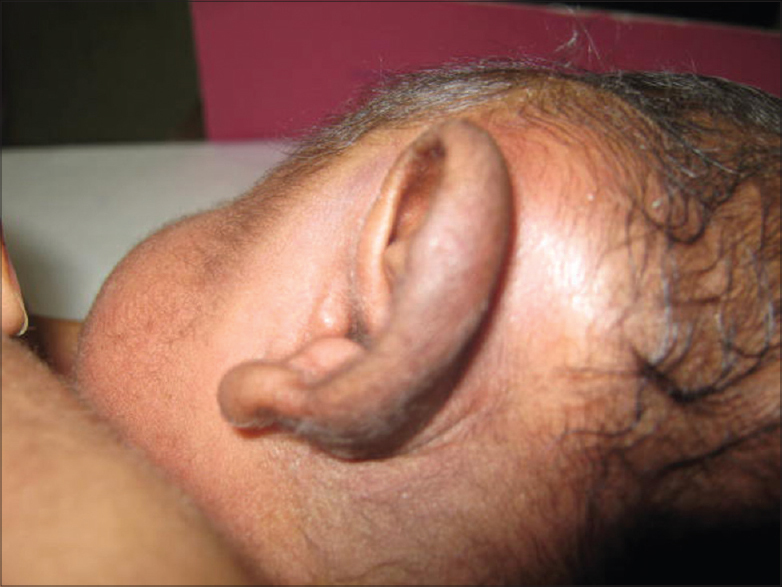 Present case of epidermoid is analysed and available literature is reviewed. Intracranial dermoid cysts commonly present as a discharging sinus, local swelling, mass lesion, or abscess formation. These can sometimes be found in association with congenital anomalies. The author presents two original cases of infected posterior fossa dermoid associated with congenital heart diseases (CHDs) that is very rare. The embryologic basis for this unique occurrence is reviewed, and a new hypothesis proposed. Two infants with CHD presented with infected midline posterior fossa dermoid. Excision of the dermoid cyst with the sinus tract was performed. Postoperative period was uneventful. Both the infants had undergone surgery for congenial heart disease a few months prior to the present clinical presentation with uneventful recovery. Infected posterior fossa dermoid cyst without a discharging sinus should prompt a thorough examination to detect CHD. Early diagnosis and timely management results in better outcome. Paroxysmal dystonias are a group of relatively benign hyperkinetic childhood movement disorders of varied etiology. Mitochondrial diseases are well known to produce persistent dystonias as sequelae, but paroxysmal exertion induced dystonia has been reported in only one case to the best of our knowledge. Two siblings born to consanguineous parents presented with early-onset exertion induced dystonia, which was unresponsive to diphenylhydantoin and carbamazepine. 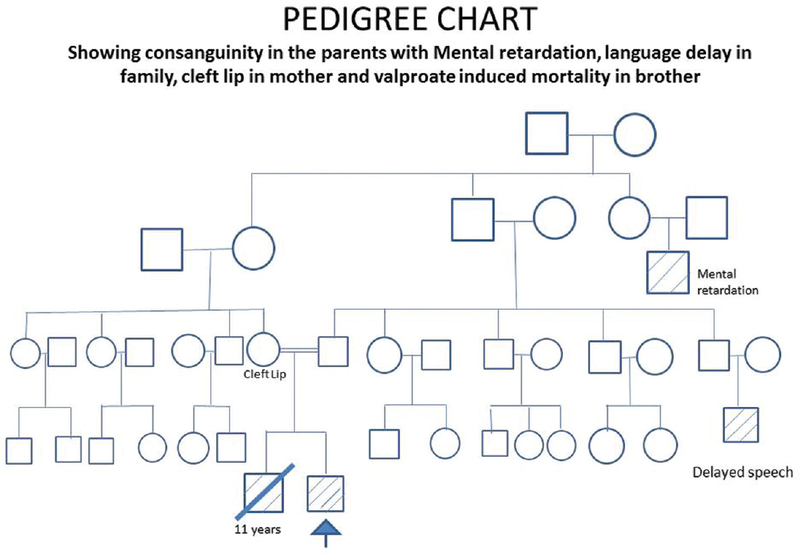 A trial with valproate in one of the siblings turned fatal within 24 h. Based on this clue, the second child was investigated and found to suffer from complex I deficiency with a paternally inherited dominant nuclear DNA mutation, which is responsive to the mitochondrial cocktail. Exertion induced dystonia can be a rare manifestation of complex I deficiency. The phenotype of cyclin-dependent kinase-like 5 (CDKL5) syndrome includes Rett syndrome variant with early onset seizures, early onset epileptic encephalopathy; and severe developmental delay. Autistic features have often been reported in literature, but detailed reports of the behavior of these individuals are lacking. We describe the clinical picture of a girl aged 15 years 9 months affected by CDKL5 syndrome, with special attention to the neurobehavioral phenotype. The evaluation showed, apart from a profound intellectual disability, the presence of atypical features of behavior, mainly in relating to people, in imitation, and in verbal and nonverbal communication, thus justifying the diagnosis of comorbid autism spectrum disorder. A formal assessment of the behavior, through appropriate tools, is necessary to choose the most appropriate rehabilitative intervention and to characterize in more detail the CDKL5 syndrome phenotype. We propose a testing protocol for the neurobehavioral assessment of these patients. Decompressive craniotomy (DC) is used to treat intracranial hypertension associated with traumatic brain injury. Early DC is associated with better outcomes. We present a neonate with a history of fall with computed tomography scan showing a large frontoparietal contusion and associated parietal and temporal bone fracture. This acted as a spontaneous DC causing bony segment to separate due to which the edematous brain could be accommodated. 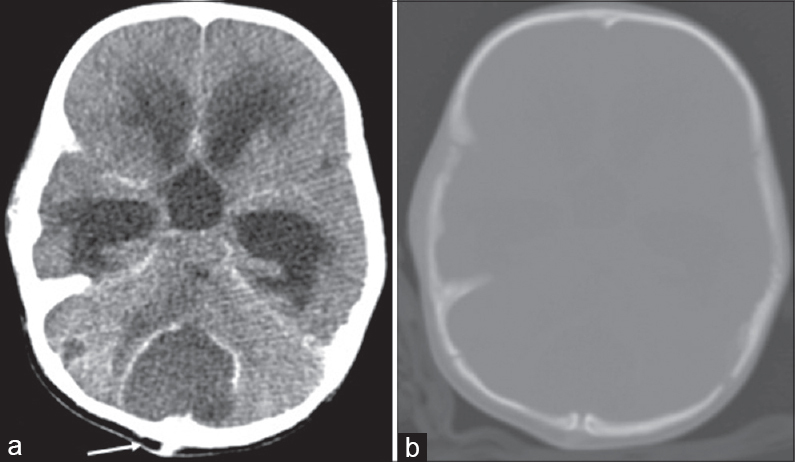 Despite the presence of a large contusion, the child was neurologically intact and medically managed. The neonate presented with a posttraumatic leptomeningeal cyst 2 months later, which had to be repaired surgically. We discuss how a linear undisplaced fracture acts as spontaneous DC and the role of early DC in improving outcomes. The present report describes a rare type split fracture of a calvarial bone, causing hypovolemic shock in an infant. The infant responded well to resuscitative measures. The authors discuss the possible mechanisms behind such a calvarial fracture. 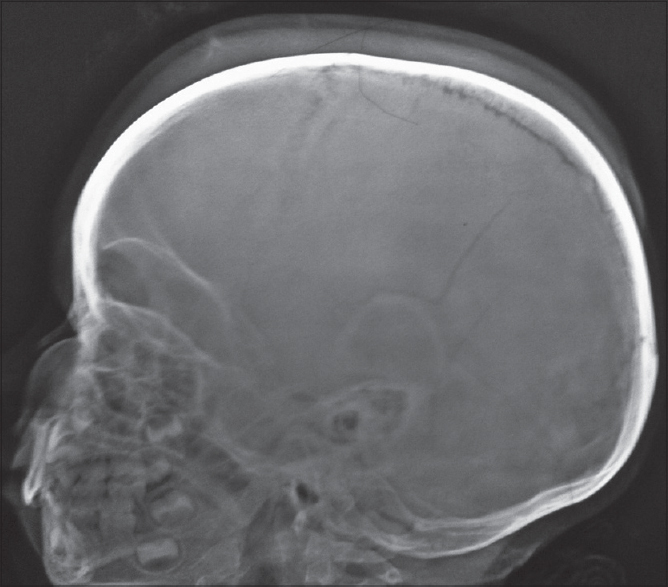 The surgical option to evacuate an intracranial extradural hematoma (EDH) was postponed in a 2-year-old female child who appeared fully alert and active after a brief spell of unconsciousness following a fall from height. The child was received, with a swelling on and around the right parietal eminence, by the emergency staff just half an hour after the time of injury. The immediate X-ray skull and first computed tomography (CT) scan head showed a parietal bone fracture, EDH, and cephalhematoma. However, follow-up CT scan head after about 4΍ h revealed the dramatic absence of EDH but increased size and bogginess of cephalhematoma. The EDH had transported into subgaleal space resulting in a decompression of intracranial compartment in <5 h, thereby preventing surgical intervention but necessitating monitoring, though there was no back flow intracranially. Extradural hematoma (EDH) occurs in approximately 2% of all patients with head injuries. Bilateral EDHs account for 2-10% of all acute EDHs in adults but are exceedingly rare in children. Posterior fossa EDHs occurs in 5% of all cases of EDHs. EDHs in children are more frequently venous (from tears of a dural sinus or diploic veins) and consequently have a better prognosis than EDHs in adults. Once the diagnosis of BEH is confirmed, urgent surgical treatment should be considered. We are reporting such rare form of injury as bilateral occipital EDH with supratentorial extension in 12 years child following road traffic accident. Infantile tremor syndrome (ITS) is a clinical disorder characterized by coarse tremors, anemia and regression of motor and mental milestones, presenting in malnourished children aged between 5 months and 3 years. Few reports of neuroimaging abnormalities in children with ITS are present. The most common finding of neuroimaging in ITS is cerebral atrophy with ex-vacuo enlargement of ventricles and subarachnoid space, some recent reports also showed pontine myelinolysis and cerebral hyperintensities. We did not find any report of thin corpus callosum associated with ITS in the literature. Huntington's disease (HD) is a rare dominantly inherited neurodegenerative disorder characterized clinically by a combination of abnormal involuntary (choreic) movements, neuropsychiatric manifestations, and dementia. It is caused by an unstable CAG repeat expansion in the gene IT15 which encodes a Huntingtin protein. We present a case of a 9 year old boy who had developmental regression starting from the age of 8 years of age along with resistant seizures and signs of cerebellar involvement with absence of chorea and is on anticonvulsants, baclofen, and tetrabenzine. As is expected in a case of childhood-onset HD, our patient is rapidly deteriorating and is currently in the terminal phase of his illness along with resistant convulsions. Acute flaccid paralysis (AFP) is a life-threatening clinical entity characterized by weakness in the whole body muscles often accompanied by respiratory and bulbar paralysis. The most common cause is Gullian-Barre syndrome, but infections, spinal cord diseases, neuromuscular diseases such as myasthenia gravis, drugs and toxins, periodic hypokalemic paralysis, electrolyte disturbances, and botulism should be considered as in the differential diagnosis. Human coronaviruses (HCoVs) cause common cold, upper and lower respiratory tract disease, but in the literature presentation with the lower respiratory tract infection and AFP has not been reported previously. In this study, pediatric case admitted with lower respiratory tract infection and AFP, who detected for HCoV 229E and OC43 co-infection by the real-time polymerase chain reaction, has been reported for the first time. 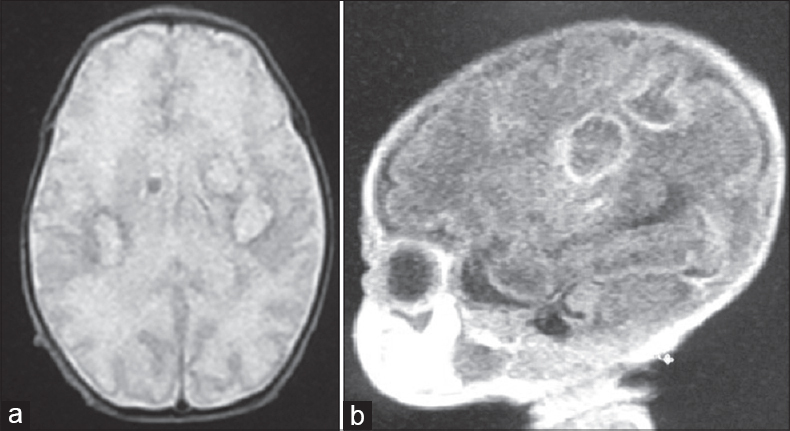 Brain abscesses occur as an uncommon complication of bacterial meningitis in the neonatal period. A 34 weeks preterm at-risk neonate presented with abnormal breathing pattern and inability to maintain the oxygen saturation in room air. Magnetic resonance imaging (MRI) study revealed intra-parenchymal brain abscesses in the left basal ganglion and bilateral fronto-parietal regions. Intravenous piperacillin - tazobactam was commenced and continued for 6 weeks in Neonatal Intensive Care Unit. No surgical intervention was required. The patient responded to the medical management and was discharged after the documentation of radiological clearance in repeat MRI study. No complications were recorded. An appropriate neuro-developmental outcome was observed on follow-up. Brain abscesses may not be preceded by meningitis in all neonates. A strong clinical suspicion is required for the diagnosis especially in cases with atypical presentation. Authors report a case of infratentorial subdural empyema, a rare complication of neglected otitis media in a child. Children with medulloblastomas most commonly present with signs and symptoms of elevated intracranial pressure due to obstructive hydrocephalus, especially headaches and vomiting. 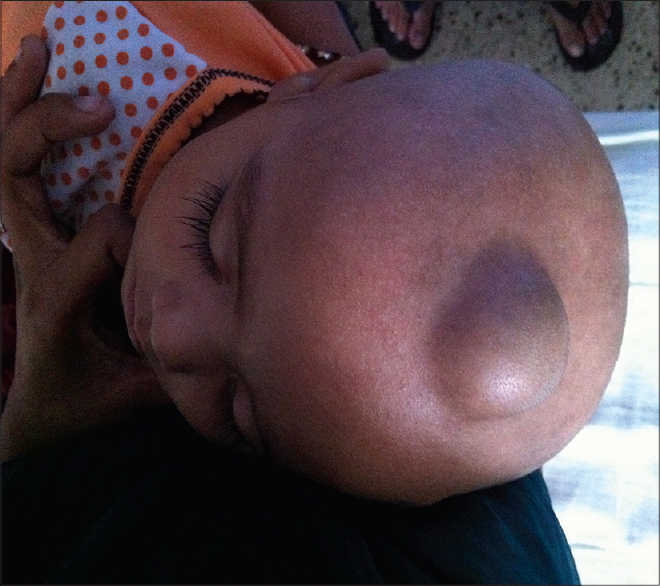 However, some pediatric patients present with sudden neurological deterioration due to intracerebellar hemorrhage associated with medulloblastoma, although very few reports exist that document this phenomenon. An 8-year-old girl was admitted to our emergency department who presented with sudden loss of consciousness, vomiting, and bradycardia. 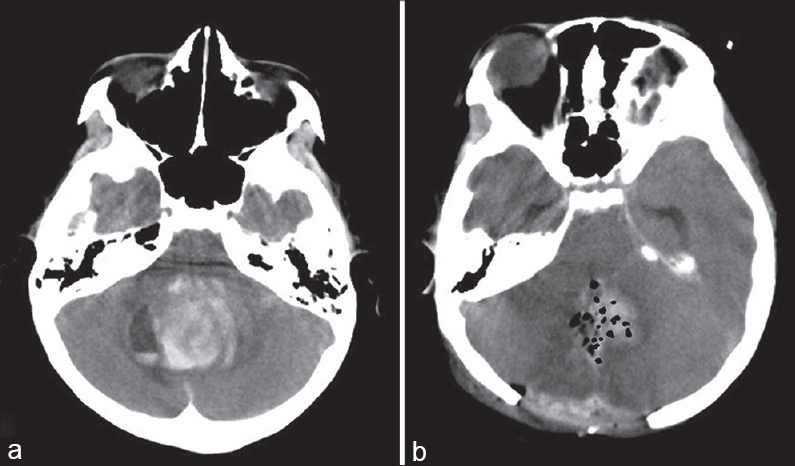 The neuroradiological evaluation revealed a hemorrhagic mass lesion in the posterior fossa. Urgent evacuation of the hematoma was performed. The postoperative course was uneventful, and the postoperative histopathological examination revealed the lesion to be a medulloblastoma. 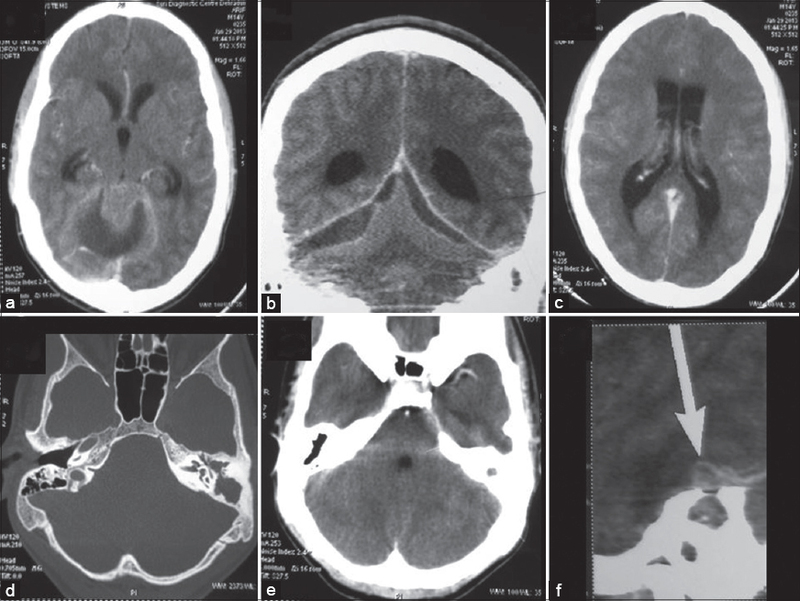 This report presents an unusual case of a medulloblastoma presenting with fatal intracranial hemorrhage in a child. 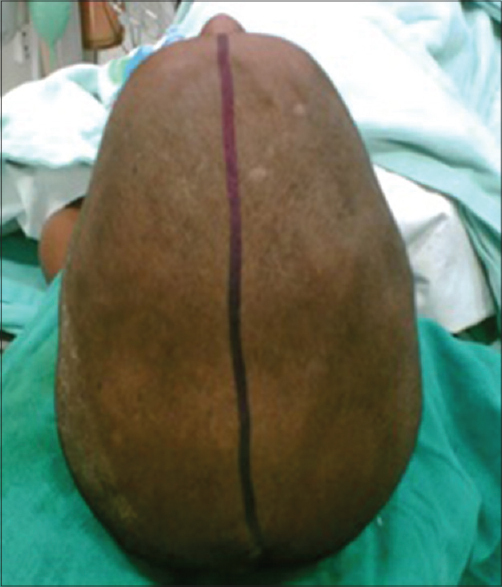 The clinical features and intraoperative and pathologic findings of the case are discussed. 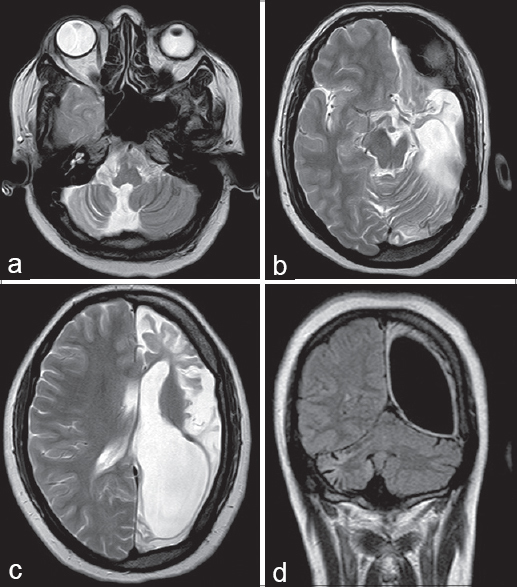 Authors report a rare case of supratentorial glioblastoma multiforme in a 13-year-old boy, who had headache, vomiting and left sided hemiparesis for last 6 months. On evaluation by primary physician he was labeled as hydrocephalus in view of enlarged head with papilledema on fundoscopic evaluation and no imaging was carried out. 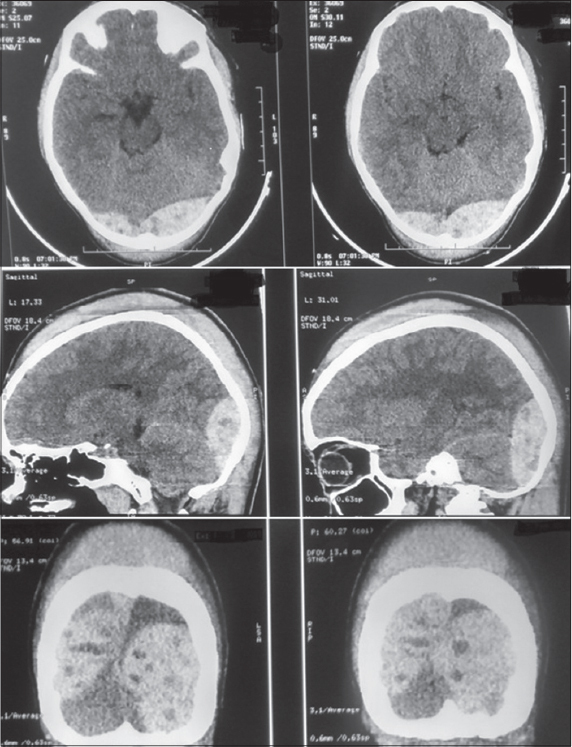 On current admission, magnetic resonance imaging brain revealed a large heterogeneous mass lesion involving right frontoparietal region associated with massive perilesional edema causing significant mass effect. He underwent right fronto-temporal craniotomy and intraoperatively erosion of parietal bone was observed, unassociated with any extradural deposit of tumor. After surgery, he noticed improvement in headache along with hemiparesis. 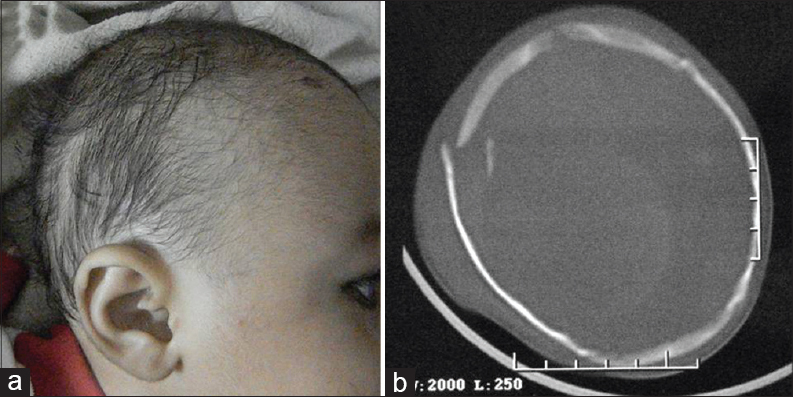 Primary calvarial erosion in glioblastoma is extremely rare, and there is paucity of literature as evident from the few case reports reported previously and all occurred in elderly, so current case is the first pediatric case having primary calvarial erosion. Management of such case and pertinent literature is briefly discussed. Acquired Dyke-Davidoff-Masson syndrome, also known as hemispheric atrophy, is characterized by loss of volume of one cerebral hemisphere from an insult in early life. Crossed cerebellar diaschisis refers to dysfunction/atrophy of cerebellar hemisphere which is secondary to contralateral supratentorial insult. 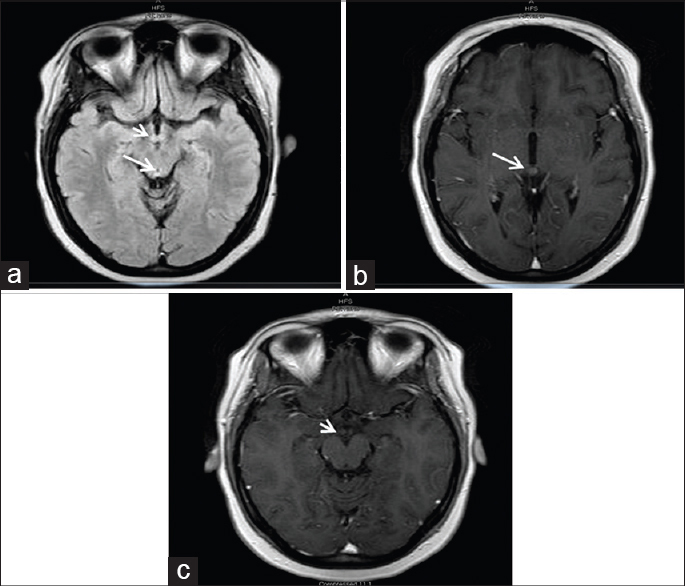 We describe magnetic resonance imaging findings in two cases of acquired Dyke-Davidoff-Masson syndrome with crossed cerebro-cerebellar diaschisis.